"Why Not Take Advantage of Your Earned Credibility by Using the NEW Ad Creator Tool? You Can ... Right Now ... With Feedback Analyzer Pro!" Extract feedback comments for any ebay seller! Have you ever browsed through other eBay member's feedback trying to figure out if they are legit and treat their customers well? Furthermore, do you specifically search for negative and neutral feedback comments to see why others disliked the eBay member? I do! In fact, I do it all the time ... especially before I buy something to make sure the member can actually deliver what they claim. So...that being said, here is a simple software tool that does exactly that. The Feedback Analyzer Pro software designed by Dave Guindon quickly separates all the positive, neutral and negative feedback comments into 3 different lists. Plus, you not only have the ability to extract the feedback comments that a given eBay member has receive; but you can also extract the feedback comments that eBay member has left for other eBay members. However, I really have to admit that the most exciting feature is the Ad Creator Tool. This single tool has the ability to instantly increase your eBay sales by simply copying some html code into your auction description. If you have received positive feedback in your eBay account ... take immediate advantage of your hard earned credibility by simply putting those positive comments inside your auctions. Now you can easily do exactly that by using the built-in Ad Creator Tool. It's fun, easy, and very FAST! Ok ... instead of reading about all the features this new software delivers, why don't you spend a few minutes and watch Dave Guindon show you exactly how to use the software? Dave Guindon provides FREE updates for LIFE! After you order the software from us you are required to provide your name and email to activate the software. You are then placed on Dave Guindon's software updates notification mailing list. If you want to receive lifetime updates, simply stay on Dave's software list and he will personally keep you up-to-date ... FOREVER! 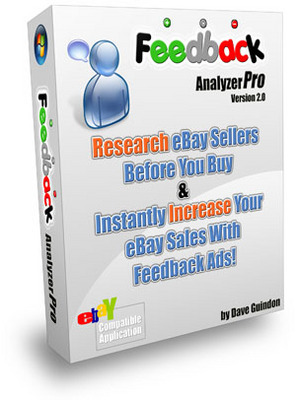 PS: If you want to research eBay sellers before you buy or create attractive income generating feedback ads ... then Feedback Analyzer Pro is what you have been searching for! PPS: Remember ... you get free updates for life and 10 free pre-loaded feedback ad templates you can start using right now!